Our offices are open from Monday to Friday 9.00 a.m. - 5.00 p.m.
Orders placed online after 5.00 p.m. on Fridays will be processed after 9.00 a.m. the following Monday. Calculated on the weight and bulk of items and can vary depending on where the goods are being delivered. Tecsound 35, Tecsound 50, Tecsound SY50, Tecsound SY50-ALU, Tecsound SY70, Tecsound 100, FT55AL Pipewrap, IsoBase R50, 2FTex Acoustic Quilt, Acoustic Membrane VL65, RFT50 Resilient Floor Tape, CAD20-Wall Panels, Foam/Barrier Composite, Fire Retardent Pyrosorb Duct Foam, Flanking Strip, Resilient Joist Cap, Cable Ties, Spray Contact adhesive, Acoustic Sealant, Foil Duct Tape, Cara Acoustic Transparent Fabric, Lucia Acoustic Transparent Fabric, Lucia CS Acoustic Transparent Fabric and Blazer Lite Acoustic Transparent Fabric. Zone 2 - BA*, BD-23-24*, BH*, BS*, CB22*, CF*, DH*, DN-14-15*, DN-18-20*, DN-36-39*, FY*, GL-5-6*, GL-8-13*, GL15*, HG*, HR*, HU*, IP-1-23*, LA-1-10*, LN*, NP*, PE*, SN-7-16*, SN38*, SN99*, SP*, SR*, SY-1-9*, SY-12-15*, SY99*, TS*, YO*. *(Postcode information is provided by professional couriers and cannot be challenged). Some goods may arrive via a separate courier during the specified delivery date. The delivery lead time for stock items is 2-3 working days (unless stated otherwise on the product page). When finalising your order, the calendar will show the earliest available delivery date (excluding weekends). We are unable to specify a delivery time (although these typically occur between 8.30 a.m. - 6.00 p.m.). All dates and times are estimates and cannot be guaranteed. All deliveries require the customer to arrange for someone to be present to accept and sign for the delivery. This ensures the goods are delivered and received correctly. If you cannot be present to sign for the delivery, you may specify a different delivery address such as your workplace or a neighbour's house, for example. Each order includes the cost of one delivery; only one delivery attempt can be made for each order. If delivery cannot be made due to the customer or the customer’s representative not being at the given address, the customer will be charged the cost for re-delivery a second delivery attempt will be made. For more detailed information, please refer to the Terms and Conditions here that are applicable to you. Enhanced Delivery Options: Same Day, Next Day, Saturday or Weekday a.m.
Only available when ordering directly with our Sales Team. Same Day deliveries are to selected areas only and subject to courier availability. For Next Day deliveries, cut off times for placing the order apply. NEW 2 Hour Delivery ETA (Pallet Deliveries only) - Because your time is precious we now offer a delivery ETA within a two hour time window! Larger vehicles (and sometimes articulated lorries) are used to make deliveries. 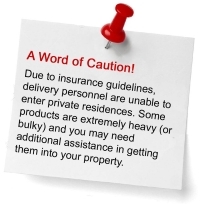 Please notify us in the Special Delivery Instructions box at the Checkout if there are any access restrictions to the property that we should be aware of. NB: Public and Bank Holidays, large national or local events and adverse weather conditions may affect delivery schedules. If you need a product urgently we would advise calling the sales team to check current lead times. Are only available when ordering directly with our sales team. Please note that collections would typically be made from our offsite storage facility in Guildford, Surrey. Some smaller, lighter items may be collected from our HQ in Petersfield, Hampshire, by prior arrangement with the sales team. If you are based in London, and need anything urgently, our Guildford warehouse is just down the A3(M). We supply products worldwide. In order to place an order please contact our sales team to check the delivery costs in force at the time of ordering.